HSE Update Issue No. 2 is now available for download. 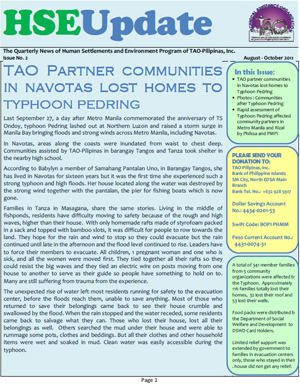 In this issue, the extent of the damages brought by Typhoon Pedring to our Navotas communities is featured. Photos of the damage assessment done by TAO-Pilipinas after the onslaught of Pedring is also shown in this issue. Details of where to donate your monetary donations are also in this issue. To download the latest issue, please follow this link. We are still accepting donations such food packages (rice, noodles, canned goods, etc. ), clean and usable clothes, old tarpaulins, and usable pots and pans in our office located at 27-A Matiyaga Street, Barangay Central, Diliman, Quezon City. This entry was posted in News and tagged damage assessment, flooding, Navotas, typhoon Pedring. Bookmark the permalink.